At Rayna Tours, we bring you premium solutions to accommodate all your airport transfer needs. Once you provide all relevant details and pre-book our airport pick-up services, print the voucher and keep it ready to present it to your driver, who will be waiting for you as you arrive at Changi Airport. 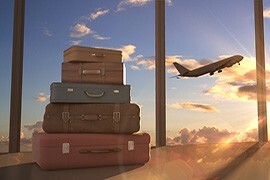 Get assistance with your luggage and then hop into your vehicle to be driven to your Singapore hotel or accommodation in the most relaxed and tension-free manner. Regardless of the requirements or size of your group, we’ve the most ideal vehicle that matches your preferences. Don’t miss out the wonderful opportunity to appreciate the splendid beauty of Singapore from both land and air! Thanks to our Singapore City Tour with Flyer experience. While our city-tour gives you an up-close view of attractions like Merlion Park, Suntec City, Fountain of Wealth, Orchard Road, and Little India as well as China Town, the Singapore Flyer ticket allows you to soak up the incomparable sights over the skyline of the city-state during your 30-minute flight aboard Asia’s biggest observation wheel. 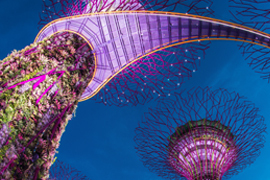 Marvel at Singapore’s signature beauty on a visit to Gardens by the Bay with Rayna Tours. This futuristic garden boasts of over 250,000 plants and flowers in more than 100 hectares of land. You’ll have up to three hours of time to discover the various segments of this wonderful garden, mainly its observatories like Flower Dome and Cloud Forest. While Flower Dome has an ambience that replicates cool climate of the Mediterranean region, Cloud Forest displays plant and floral selections that typically thrive at a height of 1000 meters to 3000 meters. Departing from Suntec City Mall, this tour onboard an adapted WWII vehicle begins as a conventional bus tour. It gives you a glimpse of some of Singapore’s most popular attractions, including Fountain of Wealth, Civic District, War Memorial, Supreme Court, Singapore Flyer etc. The most thrilling segment of the tour is when the vehicle plunges into Singapore River, feasting your eyes with the mesmeric views of Merlion, Marina Bay Sands, and Esplanade. With an audio commentary included in this unique land and river adventure, you’ll further get to know several interesting facts about the marvelous city-state. Our convenient airport drop-off lets you finish your Singapore holidays on an absolute hassle-free note. At the pre-designated time and spot (as per the booking), our polite driver will meet you to directly transfer you to Changi Singapore Airport. You can rely on our exceptionally knowledgeable and experienced drivers, as they ensure that you’ll reach the airport with ample time left for the departure flight. All of our vehicles are kept up in pristine order means you can be further assured of a comfortable ride from your Singapore location to Changi Airport. With an inspiring amalgam of dynamic past, timeless cultural sights, super stylish landmarks, and remarkably distinct gardens and parks, Singapore is one of Southeast Asia’s most favored vacation spots. Now if you’re looking for a convenient option to experience all of its treasures in a few days, our Beautiful Singapore inclusive of four nights stay plus sightseeing and transfers is definite to check off of your holiday criteria. Starting off with a city tour, it gives you the ultimate chance to discover the stunning diversity of Singapore. Spend time at the iconic Merlion Park, appreciate the city’s dynamic skyline with a drive through Marina Bay, and experience the region’s exciting multiculturalism at the ethnic quarters of Little India and Chinatown. 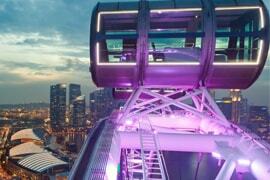 The real highlight of your sightseeing is the Singapore Flyer experience which lets you take in Singapore and beyond in all its glory on a 30-minute observation wheel ride. Take a break from Singapore’s swanky sights as you find your way to Gardens by the Bay. Boasting astonishingly designed waterfront gardens, innovative conservatories, and one-of-its-kind Supertree Grove, this 100-hectare park promises you an unforgettable and refreshing rendezvous with nature. 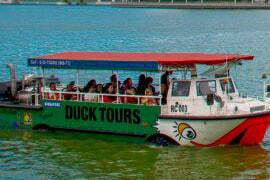 Most of all, a stunningly restored amphibious war craft awaits to take you on an exhilarating one-hour Duck Tour; it allows you to enjoy Singapore’s iconic sights from both land and water. Super exciting trip to Singapore..my kids were very happy! First of all I would like to thank Rayna Tours for such an amazing package. During the 4 days we were in Singapore, we got to see the best of the city. The city tour was great and we loved the visit to Gardens by the Bay. My kids simply loved the Duck Tour, especially when the bus splashed into the water and we got to see the beautiful landmarks of Singapore while sailing in water. I will recommend this package to anyone looking forward to a trip to Singapore. This was my first trip with Rayna Tours and the services and arrangement have really impressed me. We were welcomed by a tour representative who drove us to the hotel. The hotel room was comfortable and worth the money. We also enjoyed the tours, especially the visit to Gardens by the Bay. All tours were planned and executed well. Good job, Rayna Tours! Pricing, itinerary and inclusions of tours are subject to change without any prior notice. Extra charge applies for features not covered in inclusions. Based on your request, we can arrange private transport for all tours. Meals are not included in our tour packages, but we can arrange it for you at an extra cost. Our team should not be held responsible for any loss / damage of belongings (wallet, expensive camera, smart phone etc.) or personal injury that may occur to you during a tour with us. Kids under 12 years must be joined by a responsible adult, especially while indulging in adventurous ad water activities. Unless otherwise specified at the time of tour reservation, strollers are not permitted inside the vehicle. Depending on location, traffic conditions and such other aspects, there will be slight variations in pick-up and drop off timings. Singapore has a warm and humid climate throughout the year. But the months of December and January are relatively cooler, thanks to the monsoon season. Moreover, the weather can be unpredictable; so be sure to carry an umbrella in order to tackle all-of-a-sudden rainstorms and drizzles. Loose, comfortable clothing is recommended, regardless of the time of your Singapore visit. Pair it with a cardigan or a shawl when you’re indoors, particularly within air-conditioned malls and entertainment areas with a freezing temperature. Since your Singapore vacation may involve a lot of walking, it’s good to have a pair of comfy shoes. The city-state’s sunny climate also entails you to bring a good pair of sun glasses, besides a high SPF sunscreen to protect your skin from the unforgiving UVB rays. Smoking in public places is a serious offense in Singapore. Chewing gums is another illegal act in the city-state. Prior to making a tour booking, be sure to carefully read and understand our policies, inclusions and general information, as your payment on a tour denotes the acceptance of terms and conditions describing the package(s). Terms and conditions apply for all discount promotions and deals. Contact our representative for more details on a tour promotion.